Welcome to Part 8 of Installing Sendy and Virtualmin on Amazon Web Services (AWS). My Troubleshooting Virtualmin page should help resolve the problem. ​Select No for Preload Virtualmin libraries? and select Yes for Run email domain lookup server? ​Select No for Run ClamAV server scanner? ​Select No for Run SpamAssassin server filter? ​Select Yes for Run MySQL database server? 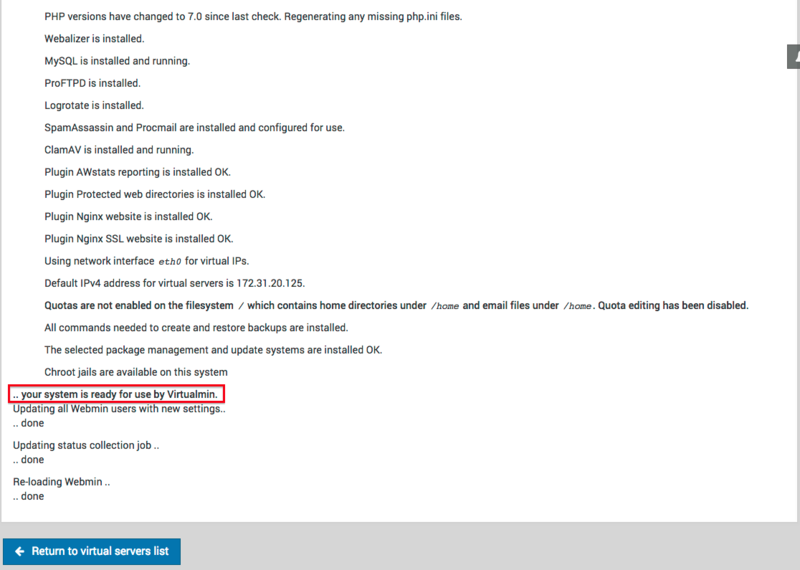 and select No for Run PostgreSQL database server? Enter a password, and make sure it differs to your server root password set in Part 3. The MySQL root password will be used in Part 12. Select Large system (1G) on which MySQL is heavily used. The Primary nameserver should already be set to Your Sendy Installation URL. Select only store hashed passwords. Click Re-check and refresh configuration. Stay logged into Virtualmin, and click here to start Part 9. Alternatively, click here to return to the Introduction.